Defence has announced it has engaged Brisbane-based company L3 Micreo to manage the production, manufacture and delivery of over 14,000 SILVERSHIELD units to the Afghan National Defense and Security Forces. SILVERSHIELD is a vehicle-mounted force protection system, used against radio-controlled improvised explosive devices (IED) by jamming signals sent through to the explosives. The units are produced by Defence under the REDWING program, and Minister for Defence Industry Linda Reynolds said, "The capability would make a real difference to the lives of our Afghan partners, providing them with confidence as they continue operations against determined insurgent and terrorist groups." "The REDWING Program is part of Australia’s broader commitment to Afghanistan’s long-term security and development." There wer 16,000 of the Australian-designed, developed and manufactured units delivered to Afghanistan in 2018, with the latest delivery taking the overall export of REDWING systems to 226,000, with a value of over $109 million since 2015. L3 Micreo managing director Sarah Earey said the company was honoured to welcome Minister Reynolds to L3 Micreo to announce the award of the SILVERSHIELD production order. 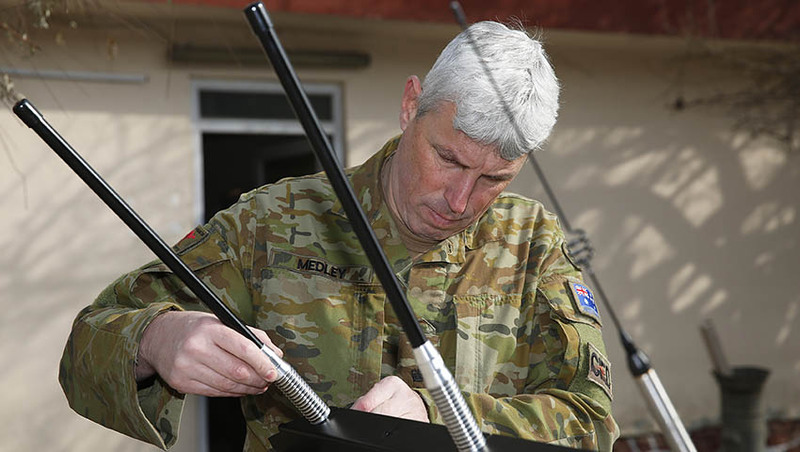 “We continue to be extremely proud to produce these life-saving force protection systems for Defence to help address the persistent and evolving threat of IEDs in Afghanistan,” Earey said. Australian suppliers Axiom Precision Manufacturing, SRX Global (Australia), ZCG Scalar and Lintek provide the major sub-systems for SILVERSHIELD.